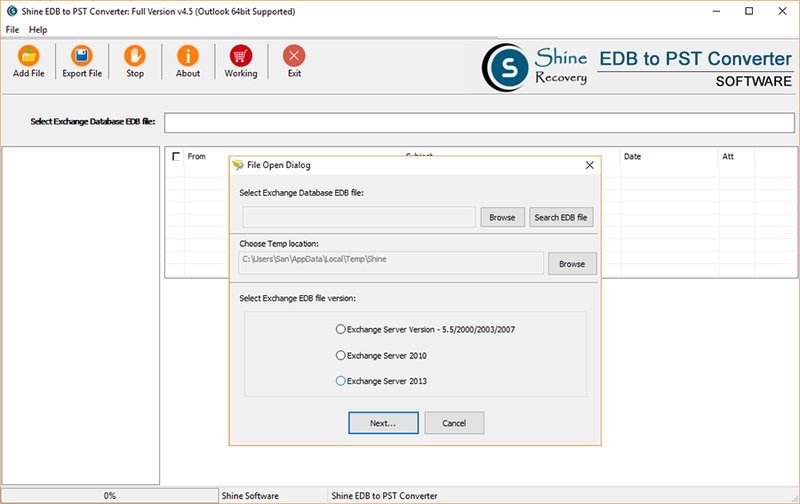 Free Exchange Recovery Software - Expert Shine EDB to PST Converter Free Software Open EDB Mailbox & recover exchange database file to convert EDB to PST, EML, EMLX, MSG & HTML. 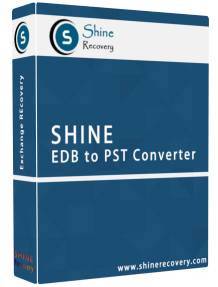 Observe Reliable Solution Free to try "Shine EDB to PST Converter" tool and get 100% authentic conversion from Free Exchange EDB to PST File. Recover Exchange Database Private & Public folder EDB file and Convert EDB to PST File as well as into Multiple format. 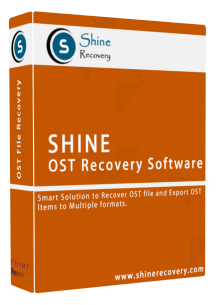 Free to try OST to PST Recovery & Converter Software to Repair OST file and Save OST to PST, Office365, MBOX, EML, MSG, HTML and EMLX files. Shine OST to PST Converter is best email recovery software to recover OST file from offline exchange ost file of Outlook 2019, 2016, 2013, 2010, 2007 and 2003 file. Live OST mailbox preview option to get complete ost recovery. I need OST file recovery once when exchange server automatically disconnected from client terminal and never conntected again.. 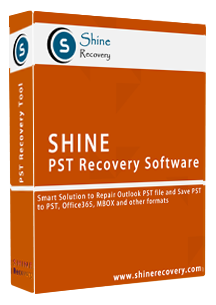 I used Shine OST to PST Recovery software and this software converted OST emails as well as contacts, calendar items to Outlook PST file. I loved this utility and keep it for future use. Free NSF to PST Converter Software easy to export Lotus Notes to Outlook PST with full accuracy and email metadata. Shine NSF to PST Converter can convert lotus notes nsf to pst with emails, calendar, contacts, journals, tasks items. Various options to convert notes nsf file to pst, eml, mbox, emlx, msg, csv, vcf, ics and html files. I am very happy to have Shine NSF to PST Converter Software! This software works awesome on my Notes 9.1 version NSF file and converted more than 35+ user mailboxes to PST format. So my experience is with this software is 100% satisfactory. 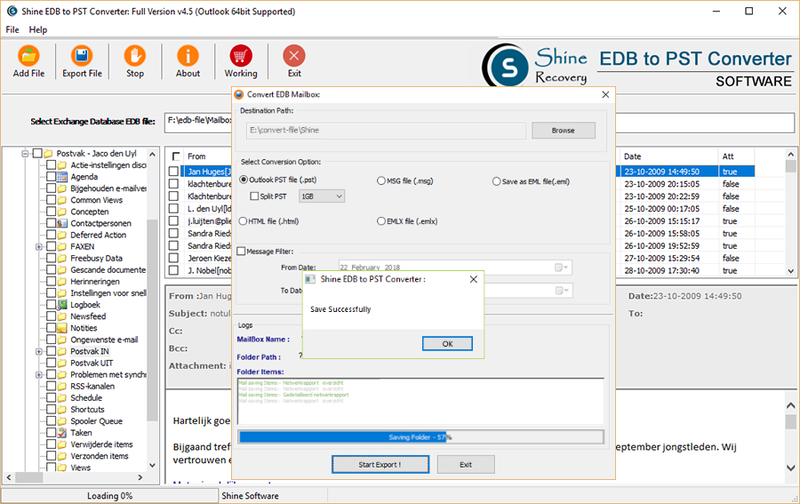 SHINE EDB to PST Converter is an intuitive piece of software for exchange server recovery that allows to convert edb file to different formats, in order to compatible with all versions of MS Outlook including Outlook 2019. MS Outlook have their own preffered file format (.pst) for storing emails, contacts, calendar, notes, tasks items. SHINE EDB to PST Converter free software will turn your EDB into PST file that compatible to MS Outlook. 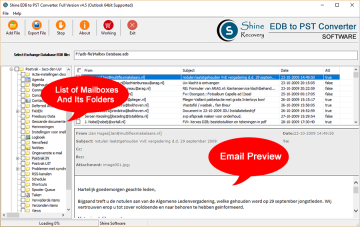 SHINE EDB to PST Converter free tool works well on larger Exchange Priv.edb, MailboxDatabase.edb and Publicfolder.edb files and export edb to pst file. SHINE EDB to PST Converter Software specially designed for exchange server administrators to recover edb file, extract and convert exchange edb to pst file without altering data. Software works on every version of Exchange server edb files and provide numerious option export edb to pst file with all mailbox folders like Inbox, Contacts, Calendar, Notes, Tasks, Journals etc. 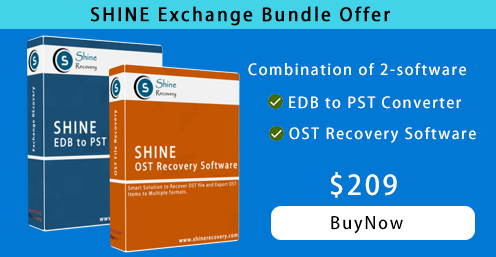 Shine Exchange Recovery Software easy to work on longest size of edb file recovery of both types of databases (Privater folder & Public folder) and convert edb mailboxes with complete folder structure. Make possible to save converted data in PST, EML, MSG, HTML and EMLX format. Save Exchange Mailbox Email Properties with Full Data Integrity: Easy to hanlde To, Bcc, Cc, subject, from, attachments, appointments. Enable to display Preview & Convert EDB File Emails, Contacts, Calendars, Notes, Journals, Tasks and all user created folder/ sub-folders. Supports to Apply Date Filter Option to recover emails by specified dates selection “From Date” to “To Date”. Compatible with MS Exchange 2016, 2013, 2010, 2007, 2003 & all below versions. *Demo version of Free EDB to PST software enables to convert 25 items from every folder. 3-easy steps to fight against exchange corruption and database inaccessibility. Once previewed each mailboxes, go ahead and export edb to pst file as well as edb to eml, msg, html and emlx file. Exchange EDB to PST Converter Software productively used for exchange EDB Recovery and convert EDB to PST Outlook file without difficulty. You can create single PST File for all EDB mailboxes with maintains emails formatting and folders structure. Exchange EDB Recovery Software offers you most excellent option to split up large PST File in smaller & more simply manageable sizes. It is additional feature; so you can check or uncheck the option of PST Split by define size. Using the option, you can create multiple smaller PST Files. Exchange EDB to PST Converter Software is capable and having good facility that it supports all corrupted priv1.edb file and pub1.edb file to recover its complete data such as- emails, contacts, calendars, task, notes etc to convert them into PST Outlook file, EML, MSG, HTML and EMLX. Selective folders/ items conversion is an advanced feature of Exchange EDB Recovery Software; you can use it to select the essential folders by check and un-check process and after complete selection of required folders and items you can move to convert it provided format. Exchange EDB to PST Converter Software has inbuilt best date range filtering option by which all users are capable to define two specified dates “ from date” to “ to date” to recover the emails along with attachments items with maintains formatting to export into PST and other format. Your software is very good in conversion I used exchange EDB to PST Converter Software you provided and it worked fast for conversion EDB to PST Outlook along with emails and attachments. Thanks a lot. Do I need to have Exchange Server to Convert EDB to PST? No, MS Outlook (32 and 64 Bit) should be installed on the conversion machine to convert EDB to PST file using EDB Recovery Software. But there is no requirement of having MS Exchange Server. Can I Convert public folders EDB File to Outlook 2016? Yes, Exchange EDB to PST Converter Software has ability to convert both; public and private folder to Outlook PST File. Does the EDB Recovery Software extract all data from Exchange EDB File and Convert as it into Outlook? Yes, this Exchange EDB Recovery Software easily extract all data of EDB file and convert them into PST Outlook file. Can I Convert Exchange EDB File to PST without Outlook Installation on my PC? Yes, MS Outlook is required for EDB to PST Conversion. MS Outlook should be installed on machine. It should also be configured with valid or dummy POP3 profile and not for exchange profile. Need any help regarding exchange migration, directly connect with our support staff. We deliver software instant once payment processing completed. Delivery of instant also on weekends. Never pay in future! One time purchase and obtain accessibility of life time license validity. All purchases insured with 30-day money back policy. 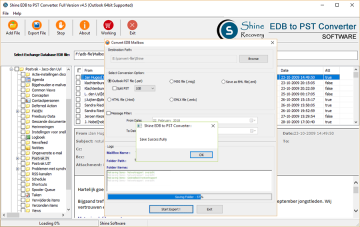 Shine Software offers exclusive feature reach solution for Exchange Database Administrators to easily open Exchange EDB file and Migrate EDB to PST as well as EML, EMLX, HTML and MSG files. Recover Exchange Mailboxes & Convert EDB to PST, EML, MBOX, MSG & HTML file. Recover Orphan OST file and Convert OST to PST, EML, MBOX, EMLX, HTML and PDF file. Lotus Notes Migrator Express to Export NSF to PST, EML, MBOX, MSG, EMLX and many other formats. Repair Corrupt Outlook PST file and Save PST Items to Multiple formats.